This recipe is simple, healthy and makes for a great Sunday meal. Preheat the oven to 200oC/gas mark 6. Grease a baking tray. Heat a medium frying pan. Add the butter, parsley and thyme and cook for 1 minute. Turn off the heat and add the breadcrumbs and parmesan and mix well. In a small bowl, mix the mustard and honey together. Place the cod on the greased tray and coat with the honey and mustard. 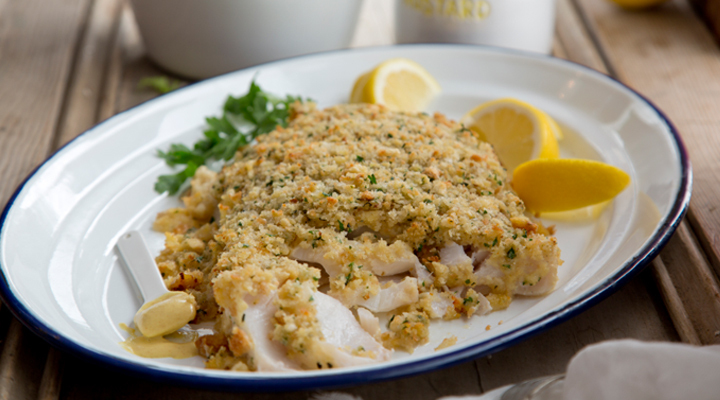 Sprinkle the herb breadcrumbs on top, then bake in the oven for 15 minutes, until the fish is cooked through and the breadcrumbs are golden. Meanwhile, whisk together the lemon juice and olive oil in a measuring jug. Place the salad in a large bowl, pour over the dressing and toss to combine. Serve the fish with the dressed salad on the side. If you're watching your fat intake, try reducing the amount of oil and butter. Loved this dish. I would cut back on the mustard next time, but that is just personal taste. What a wonderful to serve fish with flavour.